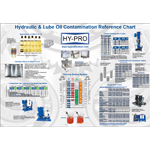 Water and particulate contamination reference chart for hydraulic and lube oil (39″ X 27″). Contact Hy-Pro (info@hyprofiltration.com) to request your free copy today! 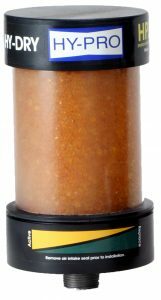 In-tank suction strainer mesh elements are available with nylon and corrosion resistant steel threaded end cap connections up to 3″ NPT and G threads. Media options include most commonly used standard 100 mesh (20, 60 and 200 mesh are available on request). Both bypass and non-bypass strainers are readily available. 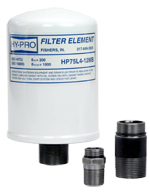 Hy-Pro high efficiency high capacity spin-on breathers prevent contaminant ingression in to reservoirs, ideal for mobile applications. Replace ineffective filler-breather caps. 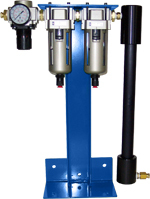 Fluid contamination is the root cause of most hydraulic system failures. Controlling airborne contamination is critical. 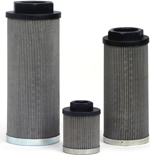 The synergy of Hy-Pro fluid filter elements and Hy-Pro Spin-on breathers yields clean fluid and a healthy hydraulic system. TMRN2 is an active breather system that maintains the air in the headspace that continuously introduces clean dry Nitrogen.As the dry N2 transfers through the headspace at RH < 1% the oil gives up its water striving to achieve equilibrium with the dry Nitrogen in the headspace. Nitrogen is an inert gas so it will also removecombustible gases (ie CO2, C2H2, CO, C2H4, C2H6, CH4, H2) from the oil to reduce oxidation and fluid breakdown.